Besides the automatic series mapping, RadChart supports manual series mapping where you have a full control on how the data is bound to the chart. You can explicitly define which data field from the underlying data source to be bound to which data point member. To set labels of the chart series. To bind to nested collections. Note that series definitions set through the SeriesMapping.SeriesDefinition property provide full support for change notifications with the exception of grouping scenarios i.e. if you will be dynamically changing the series appearance (e.g. SeriesDefinition.Appearance.Fill / Stroke properties), the recommended approach would be to assign unique SeriesDefinition instance to each SeriesMapping instance in your chart control. For grouping scenarios you can access the generated DataSeries directly (i.e. RadChart.DefaultView.ChartArea.DataSeries[i]) and update its DataSeries.Definition properties. Note that you cannot reuse series definitions in this scenario (i.e. assign single definition instance to multiple mappings) as changing a definition property would be propagated to all series (e.g. you have 3 series mappings that hold reference to single BarSeriesDefinition -- setting any SeriesMapping.SeriesDefinition.Appearance.Fill to Purple, would case all 3 series to change their color to Purple and that is hardly the expected result). The purpose of this tutorial is to show you how to use RadChart with Manual Series Mapping. The chart types that require multiple data fields, like Stick or CandleStick, need manual series mapping in order to operate correctly. 1 . Create a new business object and name it TradeData. 2 . Add a new RadChart declaration. 3 . In order to map to such kind of business objects, you have to create a new instance of SeriesMapping. 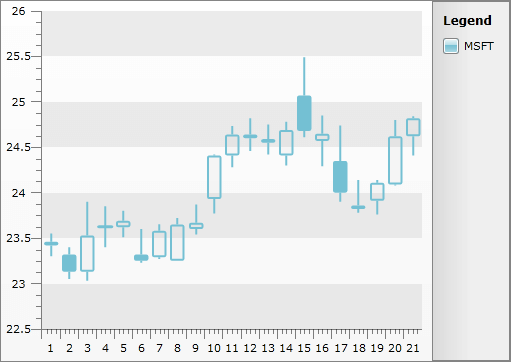 Set the SeriesMapping.SeriesDefinition property to the chart type you want to use - in this case CandleStickSeriesDefinition. You can find a full list of supported chart types here. 6 . FieldName - specifies from where the data should be taken. 7 . Set the ItemsSource property of the RadChart control. 8 . The final result should look like the snapshot below. 9 . The same functionality can be achieved with code-behind as well. Below is listed the equivalent procedural code.